Writing Industrial Copy That Sells! Since 1979, freelance copywriter Bob Bly has written hundreds of winning promotions – including landing pages, white papers, e-mail marketing, ads, and sales letters – for over 100 clients including IBM, AT&T, Ingersoll-Rand, and Intech. 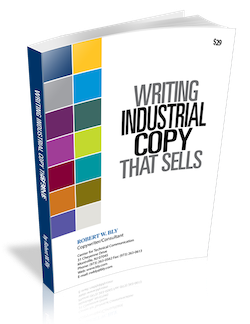 10 tips for writing industrial copy that sells. Page 2. Easy ways to make sure your industrial copy is technically accurate. Page 50. The 6 key components of high-response business-to-business offers. Page 34. How to write more effective industrial product brochures. Page 39. 6 things I know for sure about marketing to engineers. Page 9. How to prepare for a copywriting assignment. Page 53. The 7 key differences between B2B and B2C marketing. Page 13. 23 secrets of creating B2B direct mail that works. Page 45. * Please send me: FREE copy of your special report Writing Industrial Copy That Sells. FREE Copywriting Information Kit with details on Bob’s copywriting services including a fee schedule. FREE no-obligation estimate for a copywriting project.